Travel is food for the soul and a road trip is the best kind of experience one can have. It allows you to enjoy the place at your own pace — pausing the moments and capturing them at your will. While there are infinite roads to travel down, some roads have that “something special” about them — be it the landscape, the curves, the turns, or just the diversity of the route. Here’s a compilation by Bright Side of 15 amazing roads you should definitely take a trip through, which will surely give you the experience of a lifetime. Located at Panjin in the Chinese province of Liaoning, this road drives you through a beach, that is actually not a beach. It is, in fact, the world’s largest marshy wetland — where the water is covered with moss. When autumn comes the moss in this area transforms into a soothing crimson color, standing in stark contrast to the yellow fields beside it. Dividing the 2 is a long stretch of road with green borders. Located in scenic Himachal Pradesh, India — feel the mountain closing in on you as you drive down one of the most dangerous roads in the world. A number of unpredictable, sharp bends provide some real adventure and the curvy roads raise your adrenaline levels. You’ll see 2 vehicles passing each other, while there is barely ample space for one. Enjoy the majestic mountains as you drive through one of the busiest mountain roads in India. Hold on tight, this one might be a bumpy ride! With an elevation of 9,045 ft, Stelvio Pass is the highest paved roadway in the Eastern Alps. Famous for its Giro d’Italia cycling race, the road is only accessible during the summer season. Skip the car drive and opt for a bike ride — feeling the Italian winds blowing through your hair while riding through one of the best roads in the world is priceless. Honored as the Construction of the Century in 2005, it is one of the most captivating and thrilling roads in the world. With the mighty Atlantic Ocean as the scenic backdrop, the highway connects the island of Averøy with the mainland via a series of 8 small islands, offering some lush green coastal landscapes en route. The journey is different every time you travel — depending on what the ocean has to offer! Often called “The Doorway to the Keys,” this bridge connects the Middle Keys to the Lower Keys in Florida, in the US. The bridge is part of the famous Overseas Highway (aka U.S. Route 1) — one of the routes you must travel at least once in your lifetime. The entire highway has a pristine view of both the Atlantic Ocean and the Gulf of Mexico and offers the best of Florida coastal landscapes. Be enchanted with the changing hues of the sea water and the infinite sky as you capture the unforgettable vistas in your heart. 6. The Desert Road, U.A.E. This endless stretch in the vast desert will surely calm your nerves. Just imagine the sweltering sun, the smooth sand, and your swift ride — encounter nature’s arid side and feel the immortality and the renewability of the desert while driving down this road in Dubai. Experience for yourself how the journey becomes more beautiful than the destination! Once part of the ancient Silk Road, this road in Sikkim has about 100 hairpin turns in a distance of just 30 km. 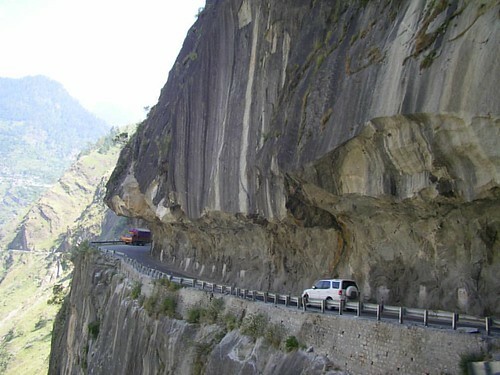 Offering the best view of the crown of Himalayas, this is one of the most dizzying roads in the world. Even the most experienced drivers can get deceived by the unpredictability of the turns. This road is not for the weak-hearted and requires a special permit to be accessed. Considered to be one of the most beautiful roads in the world, this highway is built over a river in Xingshan, China. To keep nature in its pristine form and avoid cutting through the hills and the woods, this highway was built on the water — following the curve of the river. It has some of the most vivid views of the mountain, which keeps you mesmerized and astonished. As a conscious decision toward conservation, this highway is an example of how humankind and nature can be in harmony. This highway, that passes through Utah, is a perfect canvas for painting your next adventure. Rightly called “A Journey Through Time Scenic Byway,” one often gets lost in the timelessness of the landscape while driving through it. Be astounded by the high alpine scenery — natural rock sculptures polished by the wind, quaint rural towns, picture-perfect panoramas, and long stretches of road and infinity to discover. With the gorgeous Andes Mountain range running parallel, this highway is well-known for its adventure tourism. Its hairpin bends, gravel paths, and deserted stretches make for one heck of a ride, especially with the number of horror stories associated with this route. Travel the complete stretch and experience almost everything that nature has to offer — mountains, sea, desert, and forest. Travel through here to get to know the country from the inside out. Connecting the Île de Noirmoutier island with the mainland, this natural passage is open for only a few hours a day. It is considered to be one of the most dangerous roads in the world since the complete path gets submerged underwater during high tide. Driving through this 4.3 km, uneven, stone-paved road is truly an adventure because if you’re not driving during low tide, your car will probably sink. Formerly known as Monte Tremolo, the Gotthard Pass is one of the most scenic highways in the world for a road trip. With its serpentine roads and the beautiful Swiss Alps as the backdrop, it offers breathtaking views and undoubtedly, some of the best memories of the Alps. Though, don’t get too enraptured with its beauty, since the road does have many sharp twists and turns. According to its name, this highway is mysterious and eerie to the extreme, being the country’s oldest heritage trail. Located in Stratford, the highway embraces the rugged terrains of New Zealand. 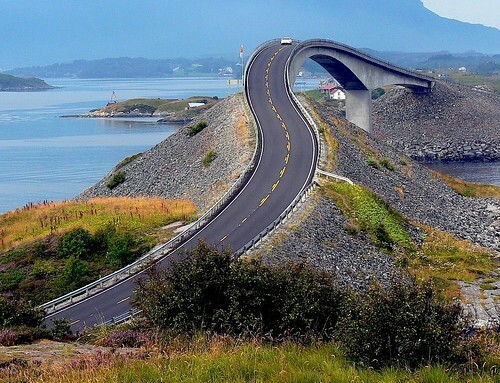 It’s often described by the locals as, “a bit upsy-downsy,” because the road provides a true roller coaster experience. One of the best marine drives in the world, the Great Ocean Road runs along the southern boundary of Australia. It is the world’s largest war memorial, dedicated to soldiers killed during World War I. It offers some of the most surreal views of sculpted rocks and an exquisite panorama of the Southern Ocean. A 3-day tour on this route gives you the best that the country’s coast has to offer. The Icelandic Ring Road, or Route 1, is one of the most scenic drives through nature — where you’ll see volcanoes, waterfalls, glaciers, beautiful fjords, and snow-peaked mountains. A number of popular tourist attractions can be accessed through this highway, including the black sand beaches of Iceland. If you happen to be traveling during the winter months and get really lucky, you may also witness the magic of the aurora borealis or the Northern Lights. Let out the wanderer in you and get ready to explore the world. Because in the end it won’t matter how many days you’ve lived, but how many of your days had life in them. To travel is to live. Did this article feed your wanderlust? Tell us your experience with the amazing roads trips you have taken in the comments!